I went to the store today and pushed around a buggy of flowers. She: You know it's going to freeze again and those plants will die. Me: Well, that's why I picked pansies since they might survive a bit longer. She: It can frost until April 15th. That's why I wait. Me: They only cost a couple of dollars each so it won't be a huge loss. (I start to push the cart towards the potting soil of freedom). She: Just so you know, pansies die as soon as it gets hot. I wonder if the security cameras caught her trying to steal my joy. I persevered despite the downer in aisle 7. 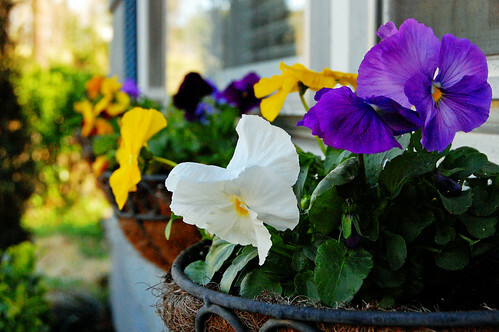 I love your window boxes and your pansies! Don't let her take your joy! I think there is a t-shirt idea in this...nah it will never work. The exact same thing happened to me last Saturday except it was a lady that I didn't know but who felt compelled to extend her knowledge. 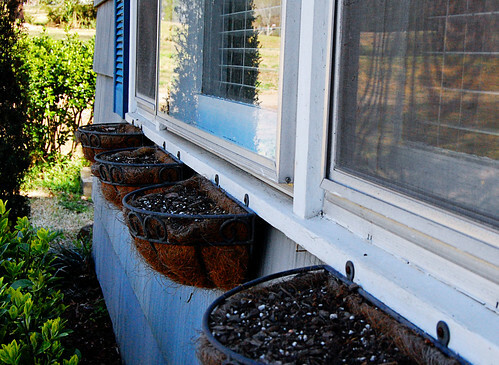 Your window boxes look great! lms: De nada mi cyber amiga! J: Big Box stores sometimes bring out the "best" in folks. beautiful! why do people have to be discouragers instead of encouragers. Actually, she was wrong about the latest it can frost in Alabama. We once had snow the third week of April - but that was before global warming! You plant anything you want anytime you want - it's your house and your money. Just remember to water them. Oscar: Once, once in a while, I, I'll take a long lunch break. Dwight Schrute: Time thief! Time thief! Fire him! Jim Halpert: Dwight, you've really never stolen any company time? Michael Scott: You are a thief of joy. K: I love that line - I tell coworkers all the time they are thieves of joy. They don't care for it.